Wow, it's been quite a while since I created a new skin for the DSTT. My previous skins are: Children of Mana, FFIVDS, FFXII "Fran," Final Fantasy XII: Revenant Wings, and Ghost in the Shell all originally uploaded as "twit21" - credit for creation seems to have been lost with the change in system and I'm just now getting around to creating a new account. This skin was inspired by my excitement for the release of third game in the Golden Sun series: Golden Sun: Dark Dawn. As usual for my skins, the menu elements for this skin are inspired by the UI within the game itself, but actually making everything fit together was a lot of work. The backgrounds and buttons are all done from scratch using Photoshop, TTMenu Skin Customizer v1.07, and my DS Lite (for source material). Due to the limitations of the TTMenu Skin Customizer, it appears in the sample image provided with this skin that the menu elements and the skin background do not quite line up correctly with each other. I don't know why that happens with this program, but the skin works perfectly in my DS Lite. This skin is intended for use with the TTMenu firmware. It will not work with YSMenu (though I suppose you could make the background images work if you wanted to). 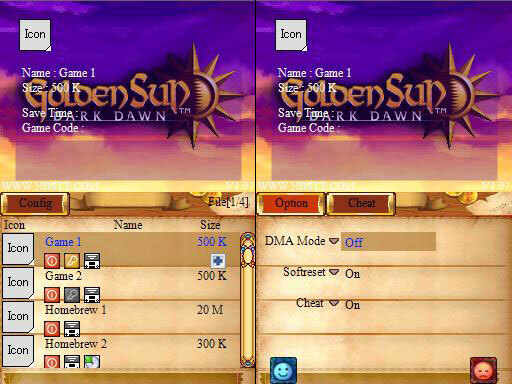 Golden Sun Skin for DSTT 1.0 NEWEST!